Blowout Sale! Free Shipping Included! 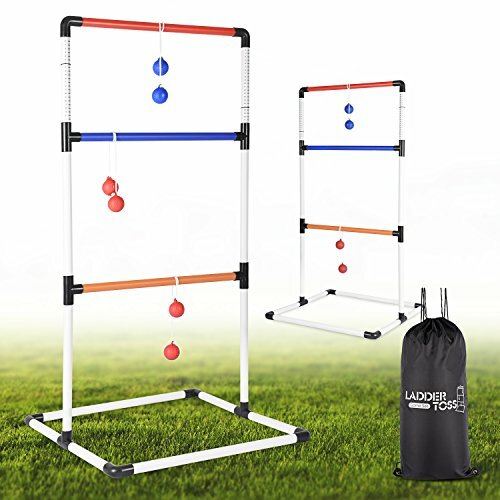 Save 51% on the Ladder Toss Ball Game Set - Box Shaped Sturdy & Stable Base – 6 Toss Bolos with Thick Rope – Built-in Score Tracker – Ideal for Indoor/Outdoor Game - With Backpack Bag – Easy Setup – 2-4 Player by Abco Tech at Scruffs Game. MPN: ABC2182. Hurry! Limited time offer. Offer valid only while supplies last. ENGAGING AND FUN - Get engaged for hours playing ladder toss game that is fun-filled & challenging. Tossing the bolos from 15 feet distance is not only fun but also challenging when aiming for the top rung of the ladder, and trying to knock down opponent's ball makes the game even more interesting. STABLE & DURABLE - Made of high-quality PVC, ladder ball game has a sturdy square shaped base which avoids tilting or toppling, and adds to the stability. This makes ladder toss game a great fit for any ground - be it concrete or grass. Thicker PVC rungs & superior joints make the set more durable. PERFECT SET - Comes with 2 PVC targets & 6 bolos with thick enough rope to avoid any tangling. The game could be set up in minutes with partially pre-assembled targets, and with backpack style carry bag, it is easy to store & carry along. Has BUILT-IN SCORE TRACKER too! INDOOR/OUTDOOR GAME - Can practice knocking the ball indoor too as the bolo is less damaging. Being a multiplayer game, Ladder ball toss game is the most interesting game outdoors. Occupying up to 6 persons at once, it is great to play at parties, on vacations & camping trips. 100% RISK-FREE SATISFACTION GUARANTEE - We also offer you 100% risk-free satisfaction guarantee to let you buy Ladder golf with confidence. However, we are sure that you will be super impressed with its quality - certainly one of the best Indoor/outdoor ladder toss game.